Eveything changed with the arrival of GATES OF HELL and I don’t mean it just in musical terms. Already with a substantial legion of fans, the void was soon filled by a group of moshers who kept themselves restless from the first song “Embrace The Reality” to the last “Critical Obsession”. The band was reduced to four elements that night, bass player Miguel Pinto absent due to “unavoidable reasons”. Raça dedicated “Hypocrisy” to him, but relax, fans, it wasn’t any kind of read-between-the-lines message. It was Miguel‘s military career that put him in Mafra that night, the singer’s dedicatory based only in its good music and not its title. During the release party of “Critical Obsession” last April, FOR THE GLORY-Ricardo Congas helped singing “Abusive Revolution”, replacing the studio special guest Esse Hansen. 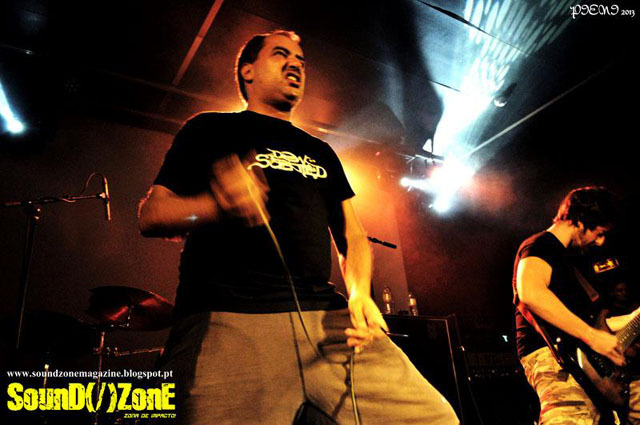 This time, however, no one stepped in for HATESPHERE‘s singer (“maybe we should have invited him to stay a couple more weeks”, said Raça, as the Danish act had played in that same venue on September 30th). But even without a bass player or special guests, the commitment of GATES OF HELL had the same excellency as ever. This entry was posted in Concerts and tagged Critical Obsession, Gates Of Hell, No Barriers tour, thrash death. Bookmark the permalink.